From April to June 2019, the triple Michelin-starred French chef Arnaud Lallement will be offering new gourmet dishes in Air France’s Business class cabins. 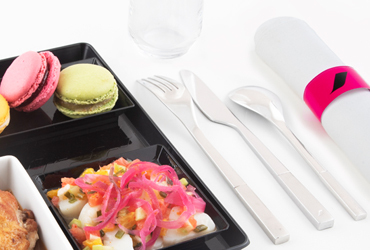 The company has asked Arnaud Lallement to design two Business class dishes, renewed every month, and available on board long-haul flights on departure from Paris as well as to certain destinations* in the medium-haul network. •           Prawns and quinoa, cauliflower medley and gingerbread crumble. •          Crab and prawn ravioli, lobster and vegetable sauce. Becoming a chef was a childhood dream for Arnaud Lallement. Nothing strange for a boy whose father owned the restaurant, L'Assiette Champenoise. Very early on, the young chef started doing all he could to fulfil this ambition: an apprenticeship with the best chefs, crowned by winning the title of chef of the year and 3 stars in the Michelin Guide. And all this before he was 40. Today, Arnaud Lallement remains committed to what he deems important – his native region of Champagne, his family and, of course, his passion for cooking. Although his father is no longer around to see him flourish, our young talented chef has chosen to turn his career into a family affair, surrounded by the three women in his life – his wife Magali, his sister Mélanie and mother Colette, who endeavour to preserve the warm welcoming environment and reputation of excellence associated with the Assiette Champenoise. The chef's secret? Refined and uncomplicated cuisine. No frills. Arnaud Lallement cooks in the same way as he lives his life: concentrating on what’s important to be completely authentic. "Real food" that seems obvious for Air France. * Medium-haul destinations concerned – Flights on departure from Paris - Stockholm, Sofia, Bucharest, Algiers, Oran, Tunis, Warsaw, Rabat, Catania, Casablanca, Kiev, St. Petersburg, Athens, Moscow, Tel Aviv, Yerevan, Tbilisi, Belgrade, Istanbul, Amman and Marrakech. Air France long-haul flights now include an a la carte menu, offered by the executive chef of a prestigious French gourmet food and delicatessen company. 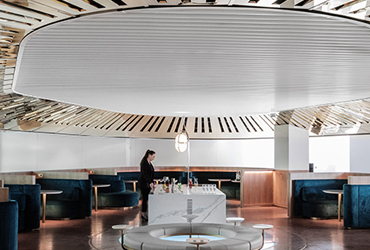 Air France presented on 12 July its entire brand new Business lounge located in Hall L of Terminal 2E at Paris-Charles de Gaulle Airport. 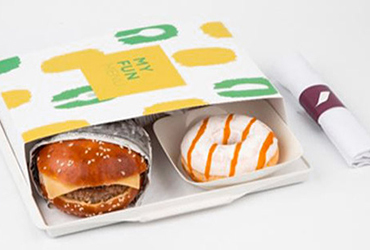 As from 1st April 2018, Air France will add a new menu to its A La Carte Menu selection on board long-haul flights* - “My Fun Menu”.